I was watching Revenge last night and it got me thinking about the role of the past in people’s lives, both fictional and real. If you haven’t seen the show, it’s about a girl whose father was convicted of a crime he didn’t commit and then murdered in prison who plots to get revenge on the people who framed him. The past defines her, her actions are a direct consequences of the anger and betrayal she feels and she can see no future until she punishes those responsible. When writing, it’s important to think about the past of our characters and how that might be shaping them now. I’ve always liked stories where a character is damaged by their past but through the story learns to move on from it. I think that always makes a great story and also one that resonates with all of us. Because unless you’re very lucky we all have some kind of demon from our past that can impact our present or future – it could be heartbreak, grief, a mistake or being a victim of a crime. And different people will be affected differently – some find it easy to move on, others struggle with future relationships. It’s easy to let the past define us – to constantly regret what we’ve said or done and mess up our present and future because we feel angry or guilty or sad, but the past can also be used positively. It should make us stronger and wiser now – show us what we don’t want or how we want to be now. Everyone makes mistakes but learning from them makes you a better person in the end. Stories like Revenge will always appeal – who hasn’t thought about getting their own back of people who have hurt us? But even if you did do that, I don’t think it would change how you feel in the long run because you would feel guilty about it – the best revenge is just to let those people go and not let them hold you back or stop you from being the person you are meant to be. Because letting the past rule your future will only make you unhappy. You don’t have to be the person you used to be – you can be anyone you want to be. How do you stop your past from defining you? You’re right – everyone has that little skeleton in the closet or ghost that they’re trying to ignore. I know I definitely have a few and they make their appearances every now and then but I’m a firm believer that ‘the past is the past for a reason’. If it was meant to be then it simply would be and that gets me through 99% of the time. There’s always that ‘what if’ you have to shove to the back of your mind, I just try to turn everything into a lesson and make sure I don’t make the same mistake a second time :] Over the past couple of years I’ve done a complete 180 of who I used to be and I couldn’t be happier with how everything has turned out. Like you said; you don’t have to be the person you used to be – you can be anyone you want to be. I wanted to watch that series but never got round to it, what with one thing and another. Putting the past to sleep can be a life time’s work I know, but letting go of it enables us to grab our future without burden. That has to be a good goal. It’s pretty good – unbelievable but compelling! I agree – I’m sure we will slip up now and again but shaking it off is the best way. Because letting the past rule your future will only make you unhappy. A huge amen to this! Forgiveness is how I let the past stop defining me. Sometimes it takes longer than others, but it’s always worth it–“warranted” for the other person or not! Forgiveness is important I agree even if it’s forgiving yourself! I read a lot of Guy Finley’s work. His inspirations really help to let go. I tend, not to seek revenge, but hold on to past hurts and anger (and those only hurt me). It feels good to let them go. Love the quote!! So true! We create our own reality. Haha I laugh at myself too! Aw that’s so lovely Lynn, that gives me hope that mine will pop up one day too! Very well said! It can be incredibly difficult but so incredibly liberating to let go of your past. It’s often so much easier to forgive others than to forgive ourselves and move forward. Thanks! I agree, it’s a learning process I think a little easier to do as you get older. Lovely post. Great letter, too 🙂 Letting go of the past used to be difficult for me, I used to constantly feel vengeful. Now though I realize that to look and move forward is the best way to go about it. Thanks! It’s a learning curve for sure! It can be so difficult to rise above your past, but those who do really make a difference in the world! Thank you so much for this. It is so timely in my own life. The imagery that keeps coming to me regarding the past and the bitterness one can choose to be pushed into. It is of a man with a wound on his arm. To seek revenge, to allow the grudge to push us into ever increasing levels of bitterness is like that man picking the wound and wondering why it will never heal. Healing will not come unless we embrace what the past would want to teach us, which I believe is chiefly to forgive and love. Thank you again for this wonderful post. I’m so pleased it spoke to you. Thank you! 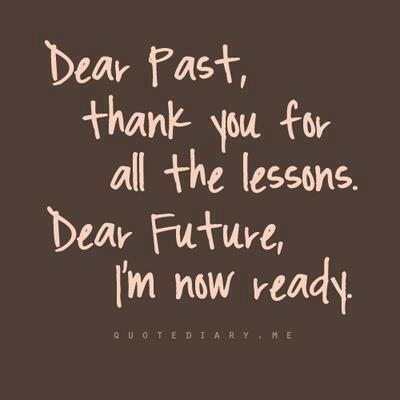 I just keep moving forward; the future can’t be any worse than the past, right?